Music fan Nathan Wood missed the festival after begin arrested at the entrance. 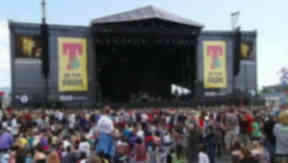 An oil worker has been fined £1350 on after being caught with cocaine just 15 minutes after buying it at T in the Park. Music fan Nathan Wood – who earns £48,000 a year - failed to see a single band as he was caught trying to take the Class A drug into the festival after buying it from a stranger in the car park. Offshore engineer Wood claimed he had only had the drug for a few minutes when he was stopped and searched at the music festival entrance. Wood, 30, Southesk Place, Montrose, admitted having cocaine at T in the Park in Balado on July 7 this year. Fiscal depute Rebecca Kynaston told Perth Sheriff Court on Tuesday that Wood was caught with more than four grams of the drug with a potential value of £220. Solicitor Keith McKinnon, defending, said: "He is passionate about music and attended T in the Park for the purpose of going to see bands over the weekend. "He travelled from Montrose in a car with friends and a quantity of alcohol was consumed on the journey. When the car was parked they were in high spirits and came across a gentleman, who was unknown to them, who offered a quantity of drugs. "Mr Wood made the stupid and irrational decision to purchase them. He paid £100. He is not a habitual drug user and purchased more through curiosity. "This is no excuse and he wishes to apologise to the court. He knew what he bought was illegal. Between the time of purchase and being arrested he was in possession of the drug for approximately quarter of an hour. "He was asked to leave the premises and was unable to view any of the live music over the weekend. He is keen to put matters behind him today. "He spends the majority of his time offshore and in the Middle East and he is regularly given drug tests which have not shown up anything. This might have severe implications for him in terms of future employment. There are various countries around the world which will not accept a person with a drugs conviction."